Well, this was the week that was! Spring is here and the leaves are absolutely such a beautiful green. The Bluebonnets are gone along with the Indian Paints. We had a wonderful wildflower season and such a surprise since it was such a dry winter. It was a fun week looking for reproduction fabrics with flowers for Di Ford’s Mystery Quilt and finding new fabrics for Lucy Boston quilt. Topic for the day is a discussion on whether or not to rip or not rip fabric. Years ago when we purchased fabric for our clothes, it was usually “ripped”, meaning that they would make a small cut and then rip the fabric off the bolt! Yup, that was then. About 12 years ago I had just started quilting and 10 years ago I started piecing as a “serious quilter” using the better grade of fabric from Quilt Shops. I remember in 2003 ordering (on the phone) some Robyn Pandolph Folk Art Christmas fabrics from a local quilt store. I was recuperating from back surgery and was unable to go for long drives, so they mailed the fabric to me. Well, stupid me thought that “quilt stores” did not “rip” fabric for quilts, but I was so wrong. I made a quilt with the fabric and started to hand quilt it (before I had a long arm machine) and the first needle stab yielded a run in the fabric. This was caused by the fact that the fabric was “ripped”. In fact, on all of the Folk Art Christmas (which was heavily dyed) the thread breakage went about 2″ into the fabric and caused the threads to be weakened throughout the yardage. I did not think it was necessary to ask if they ripped or cut fabric, but after this experience I made it a habit of asking before purchasing. That shipment of fabric cost me dearly. Each piece had to be trimmed and I lost at least 1 1/2″ off each piece. Muslin will shrink about 3″ and Moda fabrics always shrink about an inch, so a good quilt shop will make sure that you are given an extra inch to accommodate that shrinkage. This particular store did not. A few years down the road, the fabric suppliers started putting tags on the bolts indicating that “this fabric should not be ripped.” I was so happy to see them do that and I thought that those “rip or cut” questions were over. One time I was in a store and forgot to ask and when I saw that they had ripped it I refused to purchase it. In addition, I do not purchase fabric from a store that has previously ripped the fabric off the bolt because the problem is still within that bolt. So, shock of all shocks when I received an order from Jinny Beyer last week I could not believe my eyes – all fabric had been ripped. 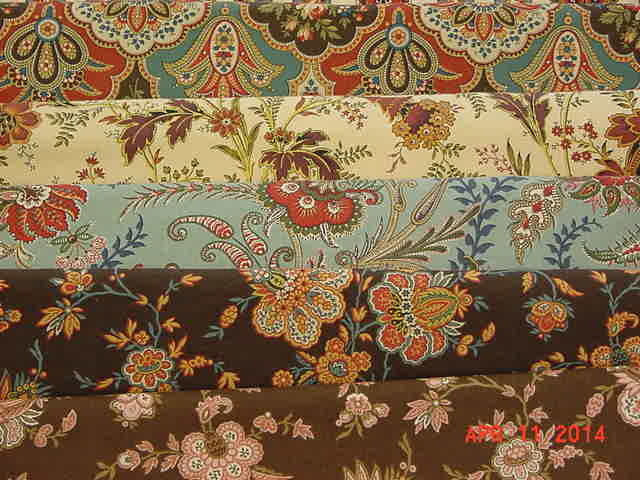 I had ordered 1/2 yards, plus a 1/4 of a yard of a variety of border fabrics. Strings were everywhere and I knew that I was the loser because by the time I had trimmed and washed the fabric I would have been lucky to have had 14 inches to work with as the pieces were cut right at 18″. The mistake was on me for not asking “rip or cut”. This mistake cost me $12.00 in shipping, plus a 15% restocking fee for returning the fabric. I was advised by the store that they state that they rip fabric on their website. I found it embedded in their “Customer Service” so shame on me for not asking, or searching the web site for that information. Who would have known? If you prefer to not have your fabric ripped you might want to purchase it from another quilt store. This is by no means a statement to slam Ms Beyer because I love her fabrics. It is a choice. There is a reason that some of the stores still “rip” at least this is what I am usually told, “it puts the fabric back on the straight of grain”. OK, but I would rather deal with that and not deal with fabric that I will lose 2 to 3 inches because it was ripped instead of cut. In the meantime, I have dealt with quite a few shops over the US this week and I must say the Customer Service was wonderful. I have received most of my fabrics that I have ordered, along with my or of 3″ clam shell, 1/2″ Hexagons, and 1″ squares from paperpieces.com for my Lucy Boston. I have also been working on Di Ford’s Mystery Quilt. 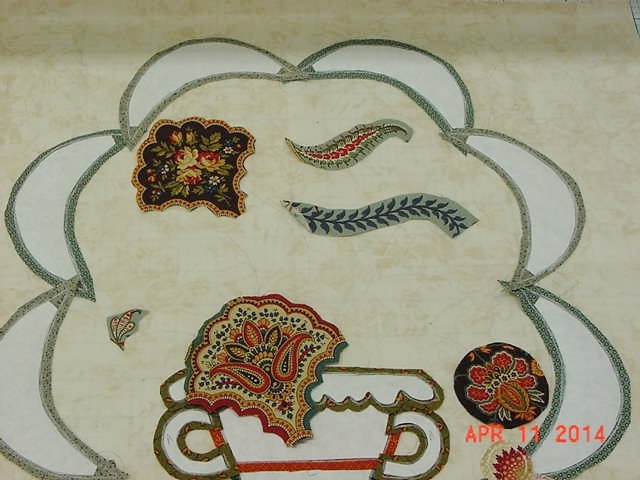 Another blogger, Happy Appliquer had indicated that she had a problem with the second border and it really concerned me because I have never participated in a mystery quilt. If I have learned anything about patterns it is to make test pattern before cutting out all fabrics for the project. I am so glad I did because I left the squares at 2″, put a strip together and realized that it would have been too long. Whew! Saved myself some heartache! I decided that I needed to confer with someone regarding this so I contacted Homestead Hearth and asked about the border cutting instructions. We discussed the problem I was concerned about and after I spoke with them the light bulb came on in my head! Sue also sent me a confirming email this morning. Many thanks to them for clarifying the instructions for me. Bottom line – the instructions are a bit confusing since they forgot to add one “itty bitty” piece of information which was to trim the 2″ square that has tiny appliqued circles on them, down to 1 7/8″ before you sew the pieces together for the 2nd border. Problem resolved. I really have not accomplished a lot this week other than spend a lot of bucks on fabric, watch Hubby put a porch roof on our Studio, and had two doctor appointments. So next week I might have something more interesting to blog about! Oh yes, I did work on fabric selection for the center medallion of the Di Ford project. Doesn’t look like I accomplished a lot, but it does take time to make sure the fabrics will blend well together. (Good excuse?) I am still auditioning the final choices for flowers. Have a great week-end and enjoy your quilting. This entry was posted in Uncategorized and tagged Di Ford Mystery Quilt, rip or not rip fabric. Bookmark the permalink. ← Moving Up to the Big Girls Quilting World from Grade School!